Metal Color is innovative range of metallic colors formulated with aluminum pigments in a water-based formula. The metallic colors selected for this range are those most commonly employed by international air forces worldwide, and their exceptionally shiny finish and reflectance allow the modeler to use Metal Color for the entire painting process without having to recur to solvent based enamels or lacquers. Metal Color can be applied directly to the model with an airbrush, or diluted with our Airbrush Thinner or Flow Improver, and dries very rapidly and form a self-leveling and homogenous paint film of extraordinary resistance while preserving even the smallest detail of the model. Can be mixed directly in the cup of the airbrush with other colors of the Model Air or Game Air series. 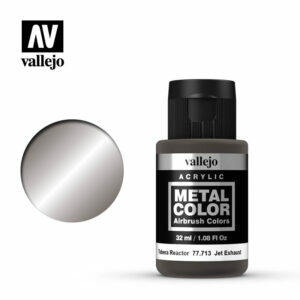 Metal Color can also be applied by brush. For airbrushing, the compressor settings recommended are around 15 – 20 PSI o 0.5 to 1 kg. For best airbrush maintenance we recommend using the Vallejo Airbrush Cleaner. For fuselages and components of airplane models, it is recommended to first apply a base of Black Gloss Primer to bring forth the unique qualities of the aluminum finish. In masking Procedures: Metal Color dries very rapidly, but it is convenient to wait 12 hours after application before proceeding with the masking process. Safety: Metal Color is not flammable, and does not contain solvents. Please see also certified safety information of the product on the Safety page. Packaging: Available in 32 ml./1.08 fl.oz. bottles with a flip top/eyedropper closure. Gloss Black Primer available in bottles of 60 and 200 ml. (2.02 and 6.76 fl.oz.) with a flip top/eyedropper closure. 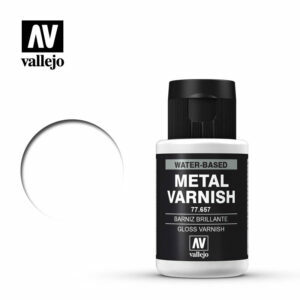 Gloss Metal Varnish available only in bottles of 60 ml./2.02 fl.oz. with a flip top/eyedropper closure.